Responsibilities include everything to do with controlling the tandem: steering, balancing, braking and gears. You also need to call out commands to the rear rider and be predictable with every move. Responsibilities include giving up all bike control and investing 100% trust into the front rider. You also need to lean with the bike into corners, try not to unbalance the bike, provide as much power through the pedals as possible, take photos, pass food, sing and generally entertain. The front chain or belt which connects the front crankset to the rear crankset, effectively driving power to the rear sprocket on the rear wheel. The horizontal frame tube that connects the two bottom bracket shells on a tandem frame. Commands are essential for the harmonic riding experience between the front and rear riders on a tandem. It is best to say all commands in a similar tone so that the rear rider can tell the difference between normal conversation and a command. Gear – Take some pressure off the pedals for a split second, whilst still spinning the cranks in order to change gears. Cruising – Stop pedalling at the same pedal location (for us it’s right foot forward) and coast along. Slowing – Stop pedalling (cruising position) and slowly applying the brakes. Stopping – Brakes are applied immediately and pedalling motion stops (cruisin’ position) as soon as possible. Ready? – A question asked by the front or rear rider to announce they are ready and waiting to ride from a stationary position. Bump – Allows the rear rider to prepare for a depression in the road by taking some weight off their saddle. Going for it – Applying as much power to the pedals as possible to make an orange light or traffic gap. 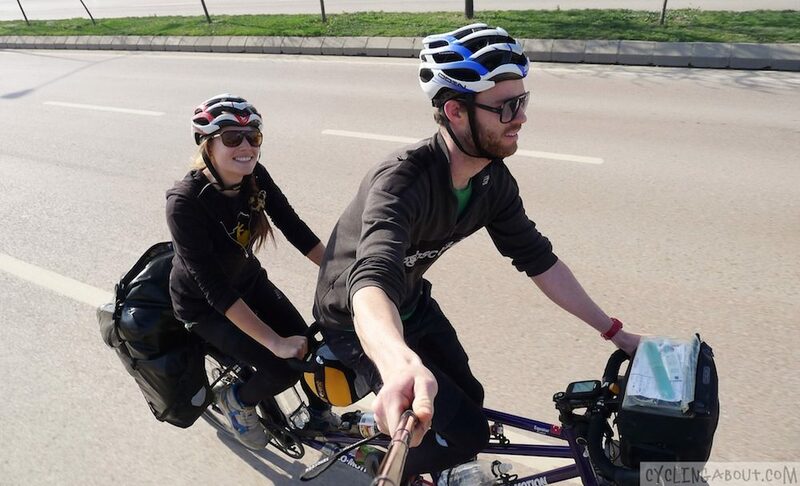 Why Are You Travelling On A Tandem Bicycle? 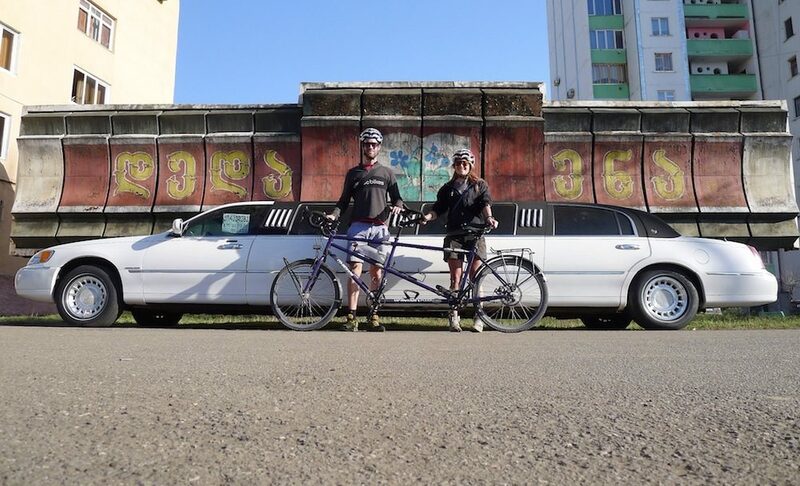 We chose to bicycle tour with a tandem because there is a big discrepancy between our abilities on a bike – everything from the speed and technical skills through to rider confidence in busy, foreign cities. Sometimes Kat suffered from uncontrollable panic attacks on the bike and riding a tandem was a great way for her to overcome those. You can read her views on the subject HERE. Great for partners of unequal riding ability. We can both ride as hard or easy as we want and nobody has to wait, ever. It’s safe. Touring in countries where men can be a bit ‘touchy’ with women can be difficult, as can travelling alone. Having both riders together at all times allows for safety in numbers. They’re fast. One bike with two wheels and four sets of legs makes for a quick ride! Not to mention the increase in aerodynamics. Our average speed on the flat is up to 50% faster than on solo bikes. No more shouting. Being heard or having to ask the other to repeat what they just said can be frustrating on solo bikes. Lighter in weight. Having one tandem is lighter than having two bikes – great for keeping the weight down for air travel. Less spare parts. When we tour, we require spare parts for only one bike rather than two. You’re forced to pack lighter when you tour. If you’re going from eight panniers to four, you’re going to need to shave some kit! Great option for parents. You can introduce your children to cycling in a safe environment. Children often can’t wait to ride their own bike after being on the back of a tandem. Great option for those who can’t ride a bike on their own. If you are vision impaired or not confident to ride a bike yourself, find a pilot. Conversation starter, attention grabber. 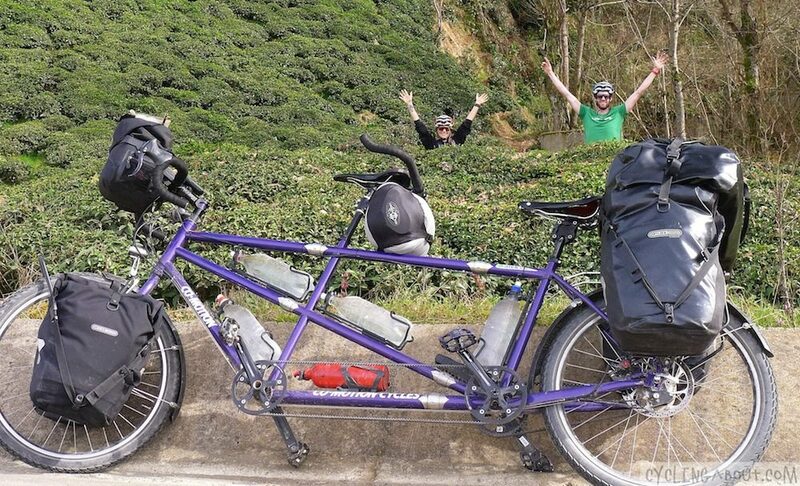 It’s very easy to make new friends with a tandem; everyone has a question. It makes you smile… and it makes others smile! We get lots more car horns, train whistles and waves on the road. If we’re waiting at the traffic lights, we are the first to leave because everybody else is too busy staring at us and not the green traffic light. Manoeuvring the bike. The bike is longer, so it takes some time to master three-point turns, up/down curbs and sneaking through traffic gaps. As the bike is so heavy when loaded, stairs become your enemy. If you want to go easy on your tandem, you MUST take off most of your panniers first and make sure you lift the front and rear wheel up when the chainrings get close to the top step! Rough roads are harder and slower. In order to protect the rear riders’ comfort and rear wheel, we can not afford to be as careless as you might be on a solo bike. They’re harder to take on a plane. With standard bike boxes mostly out of the question, taking a tandem on a plane requires slightly more planning. If your tandem frame breaks apart you won’t have any issues. That said, many airlines will allow you to take a full-length tandem on, as long as it’s within the weight restriction. For more on this subject, please read below. You will probably have wheel problems. You need really strong wheels to tour on a tandem. What’s It Like Riding A Tandem For The First Time? I decided that it was best to ride our tandem alone on the maiden voyage. The initial difference I felt was with the steering and balance points. When you make a turn, it feels like you’re sliding to the left or right, rather than pivoting on the spot. With both of us on the bike, we fought for balance for a few streets before Kat became confident enough in my ability. Once Kat was comfortable, I no longer noticed her there, and by the time we had a few commands down, tandem life was easy. The first time the bike was loaded with panniers and we were riding slowly up steep hills, I really noticed a lacking in the core strength of my upper body, but my body adjusted very quickly! The first time we rode Tan-nay-nay my heart ran an unnecessary race against the beating of my pulse, the ragged intake of my breath and the clever quick electric maze in the wiring of my brain. I knew in my heart of hearts that I trusted Alee with my bike riding life, but I still managed to feel off kilter and as though I was somehow going to fall off and sabotage the whole bike (I had dreams prior to riding Tan-nay-nay of being slit up the middle as I fell forward while braking hard down a hill… I have an overactive imagination at the best of times). But, very quickly I felt comfortable and strong and necessary on the bike. When Alee asked me ‘you droppin’ the watts, eh Webster?’ for the first time I glowed (and my thighs swelled, literally) with pride and positivity. I trust Alee 100% and know, through our shared pedal strokes, that he trusts me too. Once we’d ridden about three hundred metres on Tan-nay-nay fully loaded (down hill on cobbled streets in Istanbul, no less) I knew I would be fine. The feeling of being out of control releases your body and your heart from its firm grip, soon bolstering your confidence at riding a bike and being super speedy on your bicycle built for two. 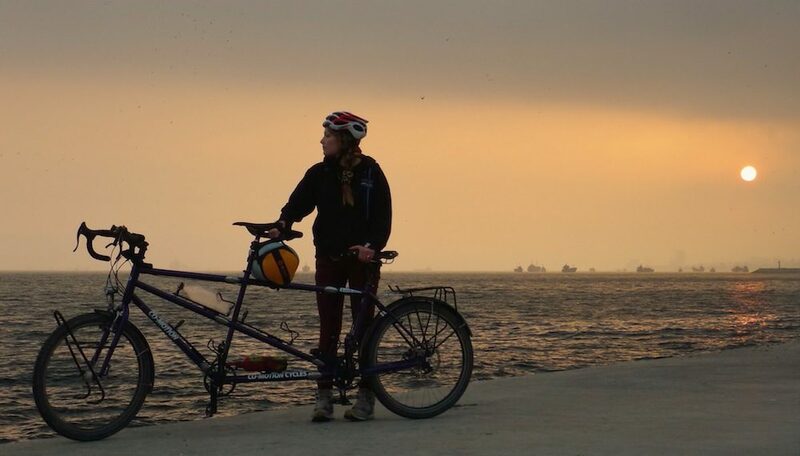 How Do You Ride A Tandem? 1. Front rider straddles the tandem, selects the appropriate gear (internally geared hub), moves the cranks to the preferred starting position (we like the right side) and stabilises the bike with a wide stance while holding the brakes. Once in position, they notify the rear rider that they can get on with a simple ‘ok’ or ‘ready’. 2. Rear rider straddles the bike and checks for traffic or potential hazards. 3. Rear rider places their foot onto the higher pedal selected by the front rider. 4. Rear rider acknowledges that they are in position (‘ok’) and asks, ‘ready’? At this time it can be useful for the rear rider to ask the front rider if the gear is suitable for take-off. 5. Front rider confirms readiness (‘yep’, ‘ok’ or ‘cool’) and does final head check. 6b. Rear rider communicates readiness and puts both feet on their pedals, providing initial power to the drivetrain before the front rider mounts their second foot. Either rider can announce that they would like to coast. Once the announcement has been made, it is best to go to a default cruising position after a couple of pedal rotations – for us that is right feet forward. In order to start again, a rider simply has to say ‘pedalling’ and you can get going a split second after the call has been made. We have found that you need to change gears more regularly on a tandem than a solo. We change gears like you would a car; when the cadence (RPM) gets to a certain spot, we move up or down a gear to something more comfortable. From starting, we literally go from gear 4-5-6-7-8-9 to get our speed back up. In order to change gears, the front rider will need to announce ‘gear’. Once the call has been made, both riders can take some pressure off the pedals for a split second, whilst still spinning the cranks in order to change gears without a crunch. This is slow to start with but becomes pretty quick when you’ve got the hang of it. Before you come to a halt, it is best to change your gear into one which is suitable for take-off. Tandems are fast, so you should be careful of pedal strike with the ground when descending at speed. When we descend, we move our outer feet (from the corner’s apex) to the lower position (6 o’clock). This better balances your weight on the bike and guarantees no chance of a pedal hitting the ground. The front rider communicates their intention to stop. This also means ‘we are stopping pedalling within a second and we will go to cruising pedal position’. Apply the brakes as normal and once stopped, take your normal feet off to straddle the bike. If you need to immediately stop with little notice, it is best not to stop spinning until a split second after the brakes are applied. This allows the rear rider slightly more time to stop spinning the cranks and will get you back to your favourite foot forward and ready to stop comfortably. When getting off the bike, it is best for the rear rider to jump off first. The front rider must make sure they are stabilising the bike well with a wide stance before the rear rider is getting off. There is nothing specific to know about climbing on a tandem, but it is essential to make sure that you are both happy with your cadence (pedalling speed) because a high cadence is best. For the more advanced riders, standing will allow you to use different muscle groups and relieve your sit bones from pressure. The riders will initially have to announce their intention to stand up. Standing smoothly requires both riders to coordinate their movement. The front rider should make sure the bars are as still as possible and the pedalling motion fluid. It is best to count down, or a simple ‘ready’… ‘go’ will do it. You can now slowly and carefully stand up! We have tried standing on our loaded bike, but as the bags are heavy (40-50kg) – it’s definitely more trouble than it’s worth. Team work. Listening, learning, leaning, pedalling, powering and placating helps the process of riding together. You do feel part of the team, no doubt. No fear. Riding at the back if a tandem means there’s no chance of losing control of the bike, there’s no need to feel incompetent, there’s no need to be scared of traffic and obstacles. Star gazing. The whole world is around you when you’re on a bike, it is one if the best things about riding – there’s nothing between you and the surrounding environment. When you’re on the back there is so much more to notice: to see, smell and feel. Navel gazing. There is always time to think as you’re riding, but when you’re on the back there’s a different kind of zen, a peacefulness that flows in. Being useful. Similar to being part of the team, but there are particular things you need to do that the front rider can’t do – when taking off for example, it is mostly up to you, the rear rider, to provide 90% of the power. Being told every single day that you can “just put your feet up” or “sit back and relax”. Actually no, both people are riding the tandem at all times. Feeling off balance. When you’re first riding a tandem and occasionally when you’re experienced at it too, the balance of the bike and the front rider can feel just wrong and there’s nothing you can do, in fact, you should learn to relax when the bike feels a bit ‘wrong’ because bad situations can be made even worse by the rear rider trying to control the bike. No control. You have no ability to steer or brake (most of the time, although some tandems have rear rider brakes) or control the bike in any way. You must learn immediately to trust the front rider with every element of control, learn to lean as they lean, work with the bike and their body. How Much Faster Is A Touring Tandem? 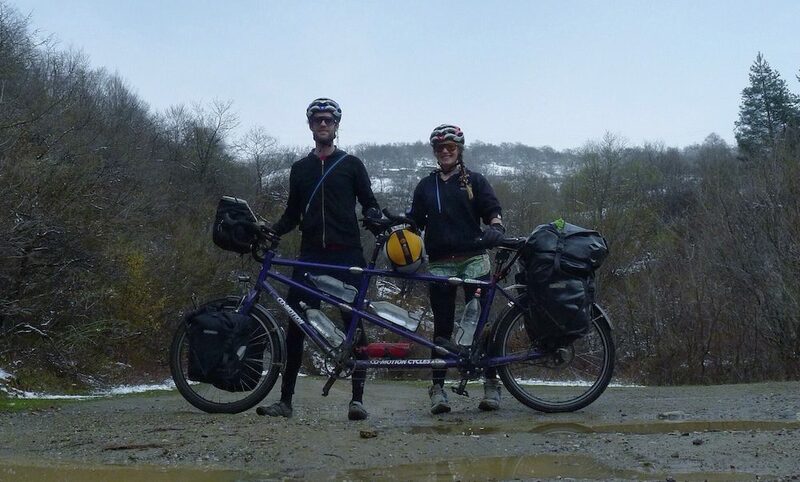 Based on our observations, we have experienced an increase in speed of between 10-30% on our fully loaded touring tandem, depending on terrain and weather conditions. On the flat, we are sometimes able to hold over 30km/h (19mp/h) when we would normally ride at 20km/h. On the hills, the speed advantage is less noticeable. Who Should Be At The Front and Rear? Sometimes body size determines who plays which role. Most of the time strength and experience will make it obvious who should ride at the front and back, but remember it isn’t mandatory to have the biggest rider at the front. From Two Bikes To One: How Much Weight Did We Save? About 11-12kg across our total bike/gear weight. We were able to send home a complete bike worth of parts, plus half of the other bike. Instead of having over 30kg of bikes and racks, we now have about 22kg – a saving of over 8kg. In addition, we lost weight in parts including two panniers, a handlebar bag, a spare tyre and spare tubes – a saving of over 3kg. Our steel framed touring tandem with racks included is about 22kg. That works out at 11kg per person – lighter than the most lightweight of adventure touring bikes. Amazingly, the lightest road tandems available are a scant 10kg! We carry about 40kg of gear when we travel on a long tour – spare parts and tools really make a dent on our gear weight. We never know where the next bike shop will be, or how long it will be between towns, so having a comprehensive list of spares and tools is important to us. You can see what we carry and all of the weights in our GEAR LIST. With our body weights (130kg), water (6kg) and food (10kg), our total weight is over 200kg. This may help you understand why brakes and wheels are so important on a tandem! How Do You Fly With A Tandem? 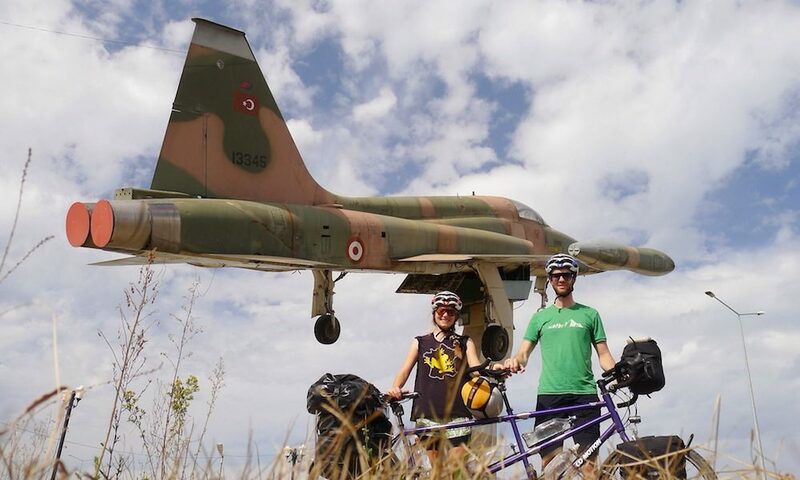 Some airlines allow tandem bikes to travel on planes despite their length, provided you’re within the weight restrictions. 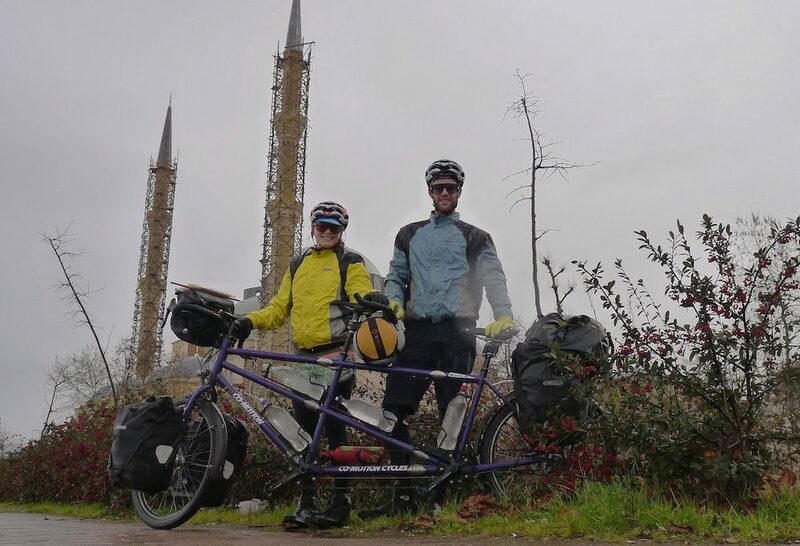 We’ve heard of many who travel with their tandem at no extra charge, provided the box is under 32kg and they’ve checked with their airline first. We spent US $2000 on six S&S couplers which break our tandem frame into three pieces. 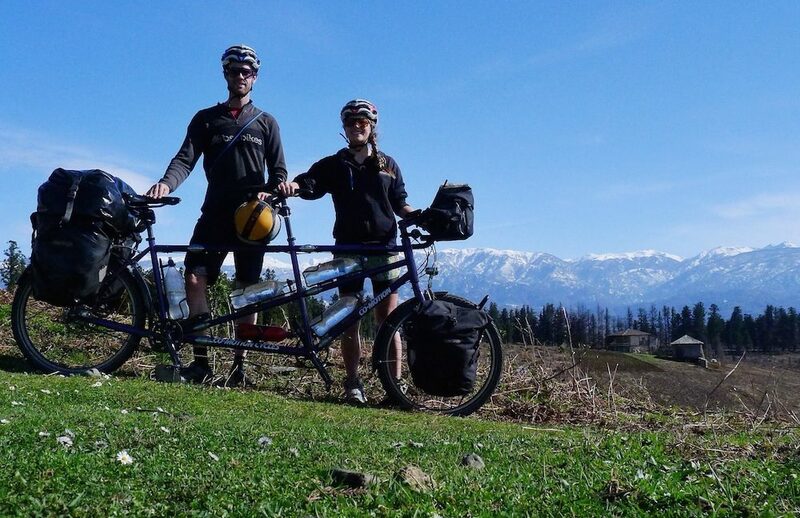 As we plan to use this touring tandem as long as we live, the cost was… kind of justifiable. The advantage of the couplers is that we can pack our tandem into two boxes with the maximum dimensions of our 26″ wheel. We found that making our tandem that small was a bit too time consuming, so we just undo the front three couplers, fitting our tandem into a regular bike box. In hindsight, we could’ve ordered a Co-Motion Equator without the middle ‘marathon’ steel tube and used just two couplers at the front of the bike. That would’ve been US $700 for the couplers and we’d still have been able to fit the bike in a cardboard bike box. How Can You Reduce Damage to the Wheels? We are mindful of keeping as much weight as possible off the rear wheel. We use rear pannier bags on the front of our bike for their extra volume, loading them as heavy as our front rack allows. This affects our steering (and is harder work for the front rider) but allows our rear wheel to last that bit longer. 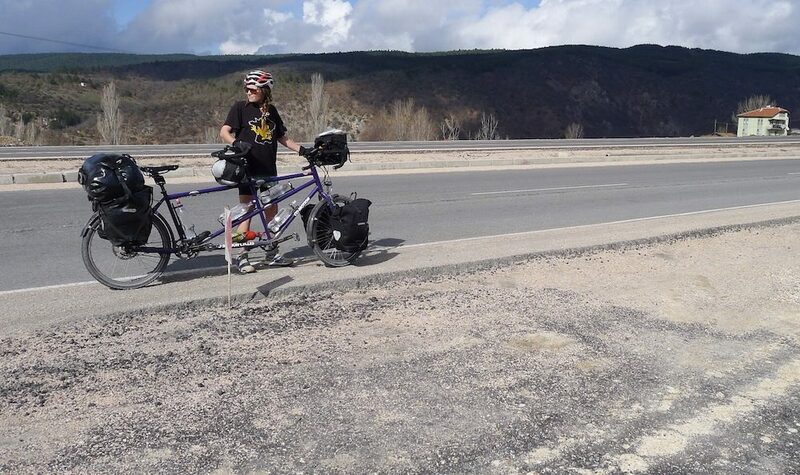 Many tandem bike tourers use a trailer to reduce their rear load, but we wanted to keep our setup as light, simple and manoeuvrable as possible. We would recommend using a trailer on low-mid range tandems (sub-US $3000) as they often come with cheaper quality wheels. We’ve put together a resource which lists most of the top tandem manufacturers out there, with pricing and links to their website. We’ve also put together a list of frame builders out there that we would personally choose to build us our next tandem frame. How Do You Size A Tandem? The sizing for your tandem is most important for the front rider because the rear rider will be able to use a greatly adjustable stem, and will have a choice of handlebars to get their position comfortable. The front rider will use the same position that they would on the equivalent solo bike. For example, your road bike measurements should be replicated on your road tandem. The most important measurements on bikes are the top tube and head tube because these measurements are relatively fixed, unlike a seatpost which can be easily adjusted up and down. Changing the stem length to make a bike fit you is possible but has a significant effect on the handling of your ride. If you aren’t sure what size you are, speak to a professional bicycle fitter at a reputable bike shop. For more on sizing, click HERE. How Much Should You Spend On A Tandem Bicycle? The most simple answer is that you should spend the same amount or more, than if you were buying two bikes. Eg. If you would normally tour with two US $1500 bikes, you should spend over US $3000 to get something of a similar standard. 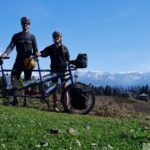 BUT, this is very subjective depending on rider experience, what you plan to do with your tandem and what standard of parts you are accustomed to. Some people choose to buy a second-hand tandem for a few hundred dollars first, to see if it suits them. 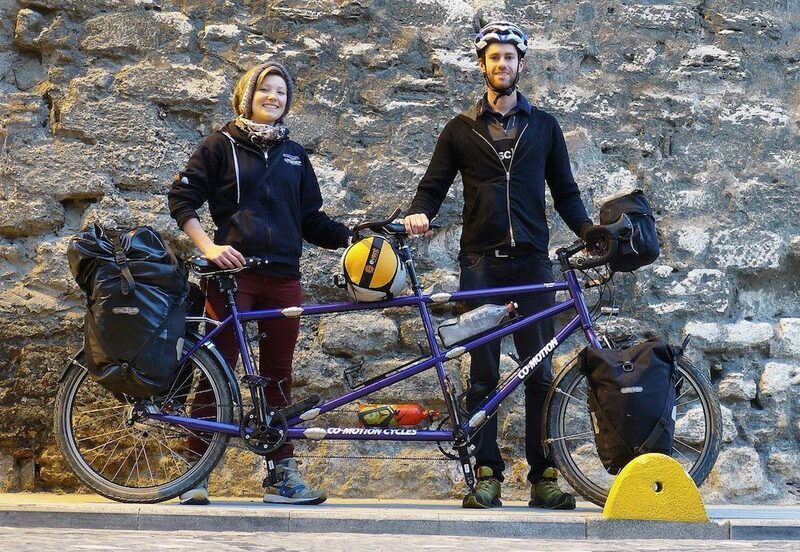 I think this is a great idea, but for us, we knew that a tandem was the best solution so we got right in there and purchased the best we could. 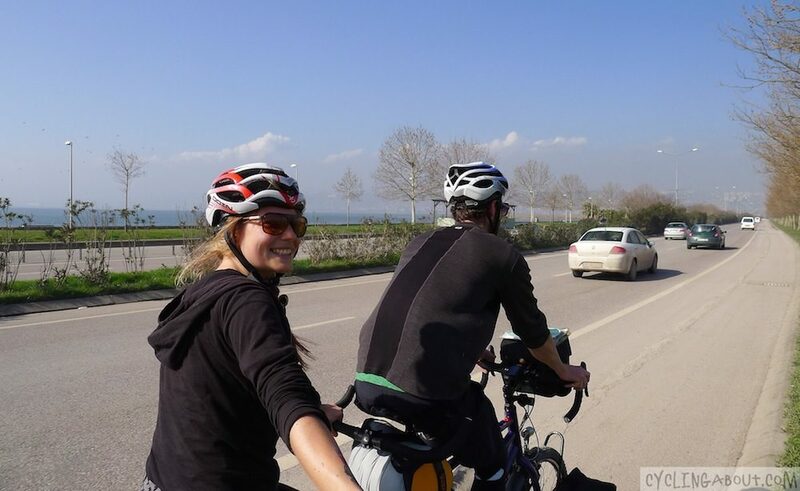 For loaded bicycle touring, you will need a bike strong enough, with exceptional wheels and brakes. I recommend US $2000 as a starting point; something with disc brakes and a high spoke count. Recreational tandems can be had for US $600 and are fine and so are road tandems from US $1200. Custom tandem frames start at about US $1500 and go all the way up to US $10000 if you really want – therefore, complete custom bikes will start at US $3500 or so. The advantages include custom frame geometry, size, materials, features and ride quality which will all be tuned perfectly to your needs. If you want to be able to break your tandem frame into two or three pieces for travel, you will spend US $700-$2000 extra on between two and six S&S couplers. How Do You Shop for a Tandem Bicycle? Tandems are hard to find in shops, so test riding exactly what you’re going to buy almost never happens. Most of the time it is word of mouth (verbal, internet or in books) which will inform you about how each brand of tandem compares. A great place to meet tandem riders is through bike clubs for tandem riders. Members of these clubs will be able to help you with any advice you require and I’m sure if you ask nice enough you can have a go on their bikes! If you just want to have a go on a tandem with your friend or partner, many bike hire places have the odd tandem, so give them a call. Speciality tandem bike shops do exist, especially in the United States where tandem riding is more popular. If you live nearby one of these shops, consider yourself lucky; this is your best opportunity to talk and test ride tandems! Who Needs A Custom Tandem Bicycle? Unless you and your partner in crime are out-of-normal-range tall or short, or want to use specific parts, you will not require a custom bike. We chose custom both for necessity (I’m 200cm / 6ft6) but also because of the specific frame features we wanted, like the ability to use a Rohloff hub and Gates Carbon Drive. To get more of an idea for the complete custom frame building process, click HERE. Do You Have To Wear Matching Clothes? Certainly not! We feel it’s too cheesy to dress the same, so we rock our own individual styles. If You Have Any Other Questions, Drop A Comment!